Brönnimann, S., Appenzeller, C., Croci-Maspoli, M., Fuhrer, J., Grosjean, M., Hohmann, R., Ingold, K., Knutti, R., Liniger, M. A., Raible, C. C., Röthlisberger, R., Schär, C., Scherrer, S. C., Strassmann, K., & Thalmann, P. (2014/2). 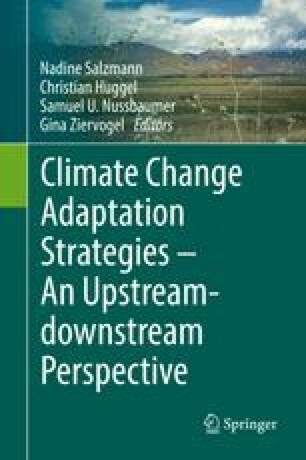 Climate change in Switzerland: A review of physical, institutional, and political aspects. WIREs Climate Change, 5, 461–481. doi: 10.1002/wcc.280. European Climate Adaptation Platform. (2015). http://climate-adapt.eea.europa.eu/uncertainty-guidance/topic. Accessed 06 Apr 2015. Federal Council. (2012). Strategie des Bundesrates zur Anpassung an den Klimawandel in der Schweiz. http://www.bafu.admin.ch/klima/13877/14401/index.html?lang=de. Accessed 08 Mar 2015. OcCC. (2015). Organe consultative sur les changements climatiques. www.OcCC.ch. Accessed 06 Sept 2015. UNCED Conference Rio. (2012). Outcome document. http://www.un.org/disabilities/documents/rio20_outcome_document_complete.pdf. Accessed on 07 July 2015. Tajikistan. The third national communication of the Republic of Tajikistan under the United Nations Framework Convention on Climate Change, State Agency for Hydrometeorology of the Committee for Environmental Protection. Available at: www.unfccc.int/essential_background/library/items/3599.php?rec=j&priref=7785#beg. The Kyrgyz Republic’s Second National Communication to the United Nations Framework Convention on Climate Change, Ministry of Ecology and Emergencies of the Kyrgyz Republic. Available at: www.unfccc.int/resource/docs/natc/kyrnc2e.pdf.